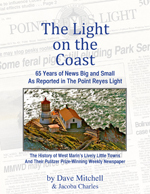 Despite what was reported last week in the calendar sections of The West Marin Citizen and Point Reyes Light, the Western Weekend Parade will be held on Sunday this year, as always. Both papers were apparently led to believe the annual parade would be held a day early on Saturday, June 6; however, a check with the county firehouse in Point Reyes Station Monday confirmed it is making arrangements for a parade on Sunday. A procession of antique tractors in last year’s parade. The Western Weekend Livestock Show will likewise be held Saturday as always. However, it is no longer held at the Red Barn but at the Dance Palace. The event, which is scheduled from 8 a.m. to 2 p.m., is a time for 4-H club members to exhibit crafts and animal projects they have been working on all year. Sunday’s parade will march down Point Reyes Station’s three-block-long main street at noon. Because the route is short and the number of entries is sometimes small, it is not uncommon for several entries — after they finish the procession — to circle around via sidestreets in order to parade down the main street a second time. The 34th annual Dance Palace Silent Auction will be held from 10 a.m. to 4 p.m. Sunday with live music by Moonlight Rodeo from 1:30 to 3:30 p.m.
Oysters and drinks will be sold on the lawn, starting at 11 a.m. Launching the forerunner of Western Weekend on Aug. 6, 1949, was a women’s sorority called Companions of the Forest. Their turreted former hall still stands across Mesa Road from the Marin Agricultural Land Trust office. That first celebration included a dance, a queen contest, a carnival, and a cakewalk, which together raised $440.65 for repairing the hall. Western Weekend didn’t become a celebration of West Marin’s agricultural heritage until the following year when the women’s husbands, who belonged to the newly formed West Marin Lions Club, got involved. They added a parade, a chicken barbecue, and a livestock show at the Red Barn (now also called the Old Engine Barn). In subsequent years, the event increasingly focused on 4-H and FFA (Future Farmers of America). During the early 1950s, 4-H and FFA were the main youth groups on the coast, and in those days members had relatively few places to exhibit their animals and other projects. Parade judges’ viewing stand last year. The women held fashion shows on Sunday afternoons, and the Lions brought in carnival rides. Eventually the Point Reyes Station chapter of Companions of the Forest merged with the Petaluma chapter, which continues to this day. Throughout the 1970s, the parade grew every year. In 1980 and 1981, it drew about 150 entries. An ad hoc group calling itself the Tomales Bay Explorers Club annually entered elaborate floats: Nessie, the bay’s own underwater monster; King Tut’s Tomb, a large pyramid complete with the king’s court; and a hug replica of one Imelda Marcos’ open-toed shoes, out of which a tap-dance group periodically slid and then performed in the street. The Wells Fargo stagecoach in last year’s parade. By then, 10,000 or more people sometimes jammed the town’s sidewalks and store roofs to watch the parade. Some merchants would later discover that drunken spectators, who had without permission used roofs for vantage points, had dropped empty beer cans down drainspouts. With the first heavy rain each fall, several flat roofs would flood, and the stores below would have water dripping through their ceilings. With so many people jamming Point Reyes Station for these monster parades, beer flowed in the gutter by the time the last floats disappeared each year — sometimes to be replaced by outlaw bikers doing wheelies down the main street. The Lions too were finding it difficult to cope with the throng, so in 1982 and 1983, they eliminated the parade although the West Marin Junior Livestock Show was held as usual. When the parade was revived in 1984, it was much smaller with far fewer groups from outside West Marin. Nowadays, a variety of groups ranging from the Lions Club to the 4-H Council to the Dance Palace to the Farm Bureau help put on Western Weekend. The gods too seem to help out. In 58 years, it’s never rained on our parade although high winds have occasionally blown floats apart.